The Whisky Boys were overjoyed to be invited to the press launch of this new dram in the Lighthouse, Glasgow. We were greeted with a 12 YO AnCnoc and lead in to a large room filled with inspired artwork by Peter Arkle (famous Scottish born New York illustrator) . We wandered and chatted, enjoying our whisky and drinking in the whisky inspired illustration which filled the walls. 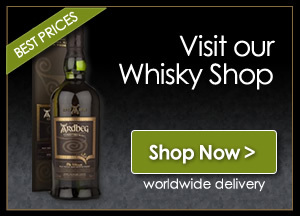 We were now sure the release would be something a little different from the Inver House owned distillery of Knockdhu. On finshing our dram we were asked to take our seats and enjoy a film depicting the making of this new Single Malt Whisky. It was at this moment I realised Peter Arkle was also in the audience along with the distillery manager, Gordon Bruce, of Knochdhu. The short film took us on a journey of coming home, seeing a working distillery for the first time, viewing the distilleries intricacies thru an artists eye and finally the selection and marrying of the final result. The film also showed us how the distillery and the “men of Knock” influenced the unique, sometimes humorous, illustrations Peter produced for the final tube, label and marketing. After the film we were treated to a dram of the new Expression. 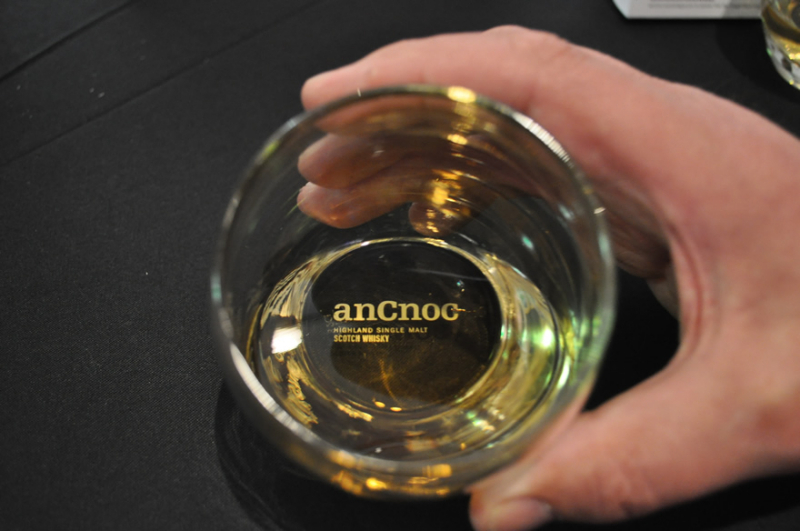 It was like no other AnCnoc – it was Sherried. Only 1,000 cases of this anCnoc scotch whisky will be released, and just 200 of these will be made available in the UK. The remainder will be distributed mostly in the US and Sweden. Excellent evening and a joy to be able to spend time and chat to both Gordon Bruce of Knockdhu Distillery and also Peter Arkle and share in his experience at the distillery and the process of making this special edition anCnoc.